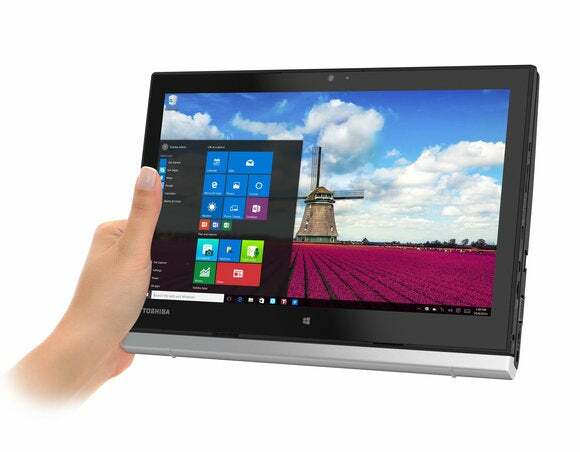 The Toshiba Z20t’s top-of-the-line C2112 configuration dispels the notion that you have to put up with sub-par performance in tablets—if you have the money. The discovery that the Z20t costs $1,700 took my breath away. That’s serious coin. But this is a business machine, and its 14-hour battery life—yes, 14 hours—goes a long way toward justifying the price. I wish other standout features on the Z20t were more common—particularly my favorite, its matte touchscreen. Hopefully, we can someday say goodbye to glare-inducing, eye-straining glossy displays. What sets the Z20t apart from the competition is its mighty battery life. As just a tablet, it matched 2-in-1 laptops like the Lenovo ThinkPad X1 by lasting 7 hours and 27 minutes in our video rundown test, which involves running a 4K video file on repeat in Windows 10’s Movies & TV app. But when we combined the tablet’s 36 watt-hour battery with the additional 36-watt-hour battery in the keyboard slice, the Z20t lasted 14 hours and 23 minutes. Yeah, that means toting around an extra pound compared to the competition, but with the Z20t, you can watch quite a few movies during an international flight—and still have enough juice left to do some actual work. The Z20t is a very dark shade of charcoal gray. Or black. 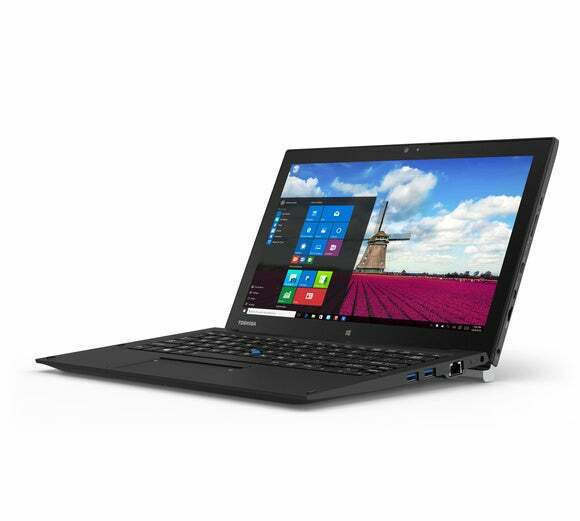 Toshiba calls it “graphite black metallic.” Combined with the matte display, it gives the unit a let’s-get-down-to-business appearance, which is fitting, because this machine is a corporate product. If the Z20T’s price doesn’t telegraph that last detail, its looks will. 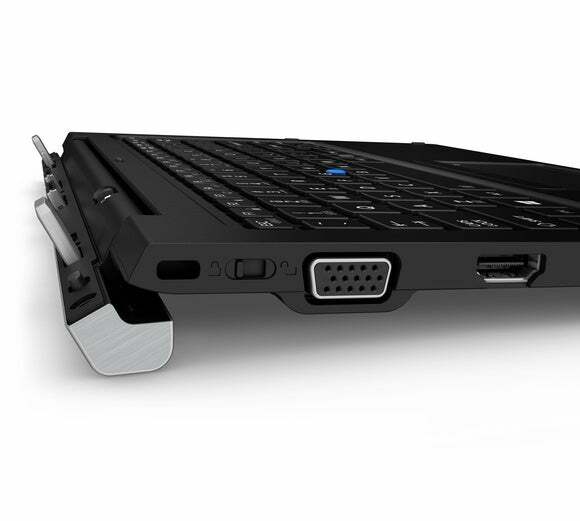 The tablet portion of the Z20t mates easily to the keyboard dock via two very solid posts with spring-loaded catches, and there are two docking connectors. There’s also a switch on the left side of the keyboard dock to lock the tablet to it. The release tab is at the top of the keyboard slice, near the display. Without the dock, holding the Z20t one-handed is doable. With the keyboard slice, as shown here? Pure fantasy. The Z20t tablet weighs a manageable 1.6 pounds. Given its approximately 12.2 x 7.9 x 0.35-inch dimensions, that feels pretty comfortable in the hand. But add the keyboard dock, and you’re talking 3.3 pounds. That heft is understandable, because there’s a 36-watt-hour battery embedded in it, but the picture above of someone holding the entire Z20t package one-handed is pure fantasy. A normal person might comfortably hold it that way for all of two seconds, if that. As a tablet, we quite like the Z20t’s 12.5-inch 1920x1080 IPS multi-touch display. The bezels give you just the right amount of room for your fingers, and the panel’s size shows a lot of text when reading books in portrait mode. It’s also a great size for movies or spreadsheets when held horizontally. With the tablet joined to the keyboard dock, the Z20t looks like and feels like a standard laptop. 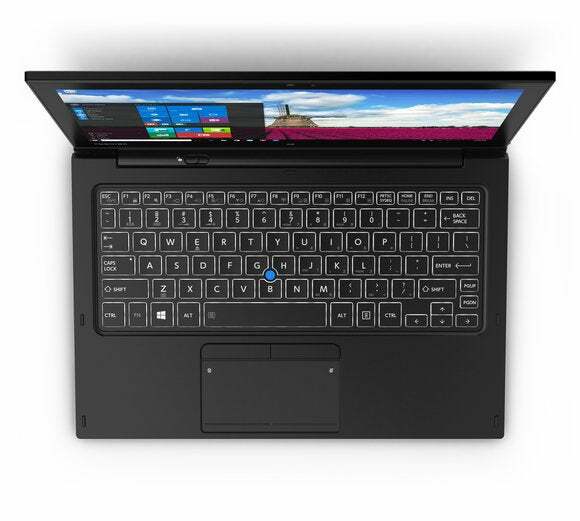 With the two halves connected, the Z20t really looks and feels like a laptop. Several times I forgot it was a combo device until we had to reach for the power button, which is placed on the side of the display. A particularly nice feature of this configuration is how the swivel mount on the keyboard dock drops a good half-inch below the rest of the keyboard slice. It provides a nice rake that makes the Z20t much easier to type on than most tablet/laptop hybrids. The rotatable hinge for the tablet provides a nice rake to help with typing ergonomics. The Z20t’s tablet ports are all situated on the right side (when docked). There’s a USB-C (5Gbps USB 3.0) connector, mini-HDMI port, and a micro SD card slot. There’s also a volume rocker and combination headset/microphone jack. The AC power port is on the long side that connects to the keyboard dock. The keyboard dock adds two USB 3.0 Type A ports and a single gigabit ethernet port on the right side, and a full-sized HDMI port and VGA port on the left side. We found the matte touch display every bit as responsive as the normal glossy variety, be it with fingers or the included stylus. And it hides finger smudges quite well. As for the keyboard, it has that nice rake angle that we described earlier, and its keys feel easy on the fingers. You do get some flex from the keyboard deck, though. The combination of the Z20t’s keyboard, touchpad, and eraserhead mouse make for a good input experience. Less pleasant to use is the touchpad, which is entirely too sensitive to taps. Unfortunately, the settings only let you dial down sensitivity as a whole, so we had to disable tapping. Other than that, while it flexes a little bit more than I prefer, it gets the job done. Aimed at the corporate market, the Z20t also sports a set of buttons above the touchpad. This layout is designed to accommodate eraserhead users, but with the trackpad buttons centered, you’ll have to tuck your right thumb way under to right-click. That’s a pretty standard compromise, but it’s not comfortable. That said, Toshiba does have one advantage over similar implementations from HP and Dell: Its eraserhead mouse’s surface is rough enough to keep your finger from slipping off. The Z20t sports the usual management functions, such as Intel’s V-Pro, AMT, and Execute Disable Bit. Toshiba also provides a limited warranty to the tune of three years. That’s in contrast with other vendors who’ve lately offered one-year on-site warranties as their standard. If you need on-site service, a variety of support upgrades exist: For example, you can upgrade to a three-year on-site warranty for $99, or four years of accidental damage coverage and on-site service for $479. The Z20t-C2112’s Core m5-6Y57 CPU, 8GB of DDR3/1600MHz RAM, and Samsung 256GB M.2 SATA SSD may not sound hugely impressive—it’s a fairly standard set of parts for a hybrid laptop, and there’s still competition that uses faster components, like the Surface Pro 4 with its Core i5-6300U CPU. Still, the Z20t is pleasant to use and handles typical office work easily. 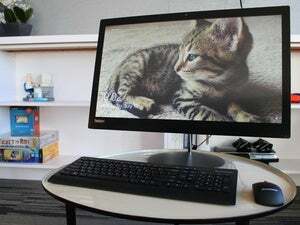 The Z20t scored a 2,747 in PCMark 8’s Work conventional test, which simulates an average cubicle worker’s computing habits: word processing, web browsing, non-intensive spreadsheet use, and video chat. This kind of workload isn’t very demanding, so you won’t see a huge gap in performance between the Core m5 and faster processors. Speaking more subjectively, this hybrid feels quick enough during basic use. The Z20t took a rather ponderous 3 hours, 40 minutes to complete our Handbrake encoding test, which involves transcoding a 30GB 1080p video file to a smaller MP4 file using the Android Tablet preset. For machines using low-watt chips (like the Z20t and its 4.5W Core m5-GY57), this benchmark is essentially a thermal torture test—one that shows how heavy CPU utilization will affect a particular laptop’s performance. Depending on the manufacturer, some laptops will spin up the fans to hang onto more speed, while others will throttle clocks back to keep things quiet and cool. The short of it is, while you could use the Z20t for intensive content creation tasks, you wouldn’t want to. It’s not designed for that purpose anyway. 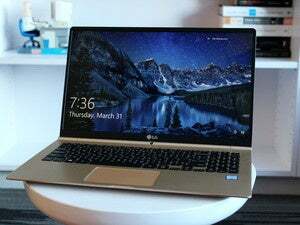 More important for a hybrid laptop like this is how fast it feels for everyday, mundane computing tasks. 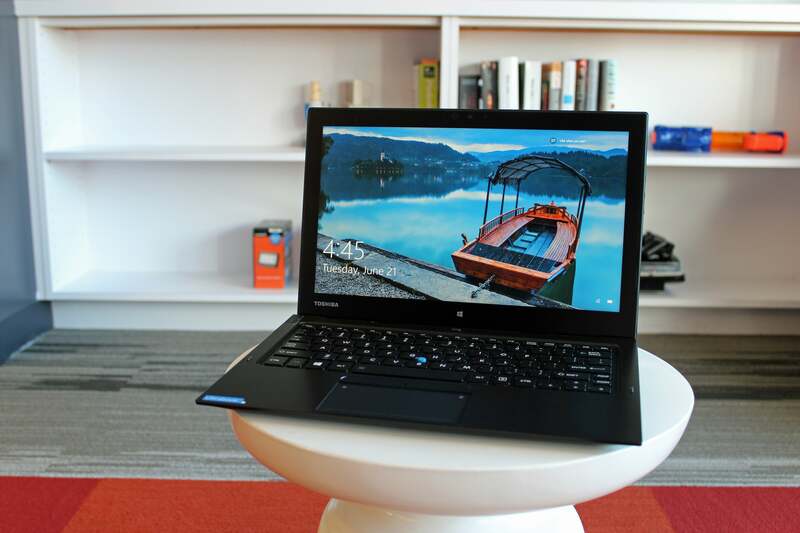 Its Core m5 CPU is quick enough, as outlined above, and so is its storage. The AS SSD storage benchmark clocked the Z20t’s Samsung PM871 SSD at 480MBps for read speed and 261MBps for write speed using a 1GB data set. That’s right on spec for that drive. In the 10GB test, writes dropped rather precipitously to 160Mbps, but this won’t affect mainstream users. Overall, the fast sustained read and slow sustained write speeds mean you get the snappiness of an SSD during boot and when loading programs and files, but not nearly as much when closing programs, saving files, and copying large amounts of data to the drive. 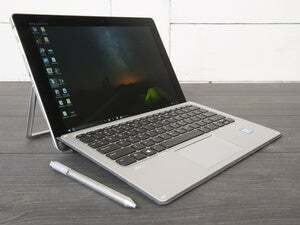 When its two halves are joined, this tablet with a keyboard slice is one of the better laptops we've seen. Outstanding battery life is a hallmark in both configurations.